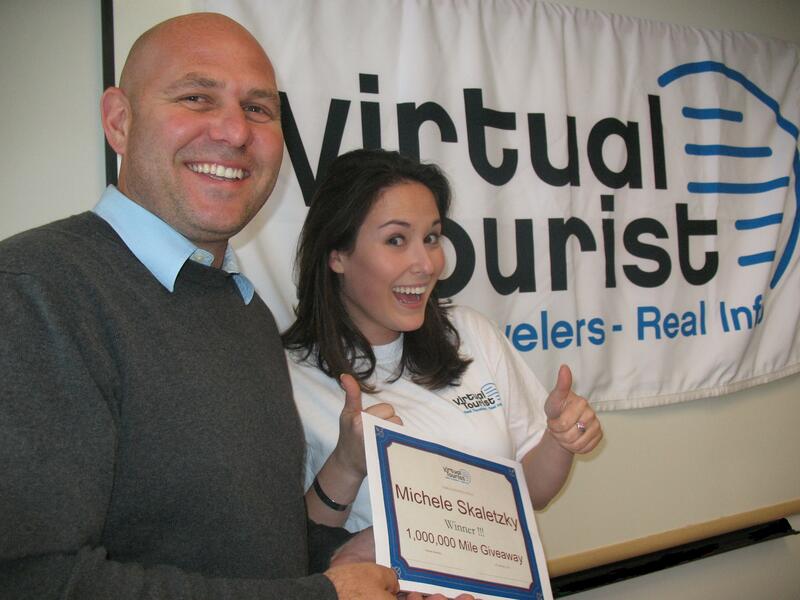 Travel research website VirtualTourist.com has just announced the winner of the "1,000,000 Mile Giveaway," the first ever internet sweepstakes using a Facebook application. This is nuts! I never win anything! 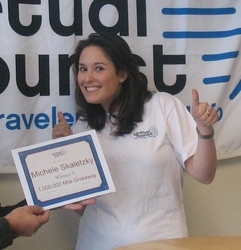 Leading travel research website VirtualTourist.com has announced USC student Michele Skaletzky as the winner of the ''1,000,000 Mile Giveaway,'' the first sweepstakes to use a Facebook Application as a means of entry. Starting in September, every user who downloaded VirtualTourist's Travel Map into their Facebook account was invited to enter the grand drawing for 1,000,000 frequent flyer miles. The VirtualTourist Travel Map application, which allows travelers to record destinations they have visited, lived in, or wish to go, won instant user-approval when launched last year. Originally designed as a way to track countries, the map now has a cities feature that allows users to zoom in to exact streets, making it one of the most popular travel applications on Facebook. The prize, one of the biggest of its kind, was designed to allow the winner to go literally anywhere they wanted and then some. With this many miles, a traveler could fly back and forth from Los Angeles to New York City every month for over three years, or around the world five times, which means Skaletzky better order extra passport pages. Skaletzky will be able to redeem her 1,000,000 frequent flyer miles through US Airways Dividend Miles program. Dividend miles can be redeemed on Star Alliance airlines, which include Air Canada, Air New Zealand, Asiana Airlines, Austrian Airlines, Lufthansa, Singapore Airlines, United Airlines and US Airways, among others. 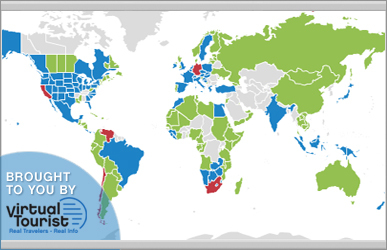 A customizable world map on which users click to mark cities and countries they have visited, lived in, or wish to visit. VirtualTourist's Travel Map is the first of its kind. This Facebook application is the first internet travel map that automatically updates and synchronizes across numerous websites when edits are made by the user. VirtualTourist's Travel Map can be created on VirtualTourist.com and Facebook. Customized maps can then be quickly exported for viewing to any Web page that allows HTML coding, such as MySpace or most blogs. VirtualTourist.com is one of the largest online travel communities in the world and a premier resource for travelers seeking an insider perspective on travel information, from Las Vegas hotels to New York City restaurants. At http://www.virtualtourist.com, real people share real advice on places they've traveled as well as their hometowns; they research and plan trips, and they interact with other avid travelers via travel forums and email; over six million travelers use the site monthly. VirtualTourist boasts more than 1.5 million travel reviews and 3 million photos on more than 55,000 destinations worldwide. Unbiased, user-generated content on Hotels, Attractions, Local Customs, Tourist Traps and much more is posted entirely by VirtualTourist's more than 970,000 registered members from over 220 countries and territories, and the site's Trip Planner feature allows users to create custom print-and-go travel guides. Among VirtualTourist's awards and accolades: 'Sites that Changed Our World,' The Guardian; 'Favorite Website,' Newsweek; '35 Best Travel Sites,' Travel + Leisure.